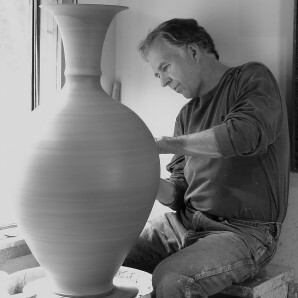 Bill Boyd began making pottery in 1970, in Sweden, where he worked with several talented potters and taught ceramics. Over time, the Scandinavian influence melded with an Asian aesthetic, bringing Boyd to his signature work of classic simplicity. “I am interested more in creating beautiful ceramics admired by all cultures than in creating something unique.” In the past his work was associated with the more subtle glazes such as Shino, Temmoku and Celadon.